This will be an exciting weekend for me. As you’re reading this I’m at the Haven conference soaking up as much blogging goodness as my little ole brain will hold. Ready for another amazing house tour? 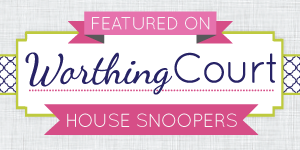 Hi, I’m Holly from Storywood Designs and I’m seriously excited to be part of Suzy’s House Snooping series! House tours are one of my favorite blog features and I could (and do!) get lost reading them for hours. Suzy has featured some amazing homes in her series and I’m honored that she asked me to be part of the group! I live with my husband Mike, our 2 boys James and Jack and our 2 golden retrievers Gracie and Emma. We’ve lived in our home for almost 6 years and Storywood Designs is my little place in the world to write stories about making our house a home. I am a big fan of working with what you’ve got in decorating a home and I love finding new purposes for old pieces within my own home. Furniture is the main character in my home stories… I’ve been blessed to have many pieces passed down to me through the years from family and I’ve loved transforming those pieces to fit our life, to fit our home. We’ve changed a lot in our home in the six years we’ve lived here… I don’t think that there’s a wall we haven’t touched. One of the first things we did upon moving in was paint and landscape the exterior. 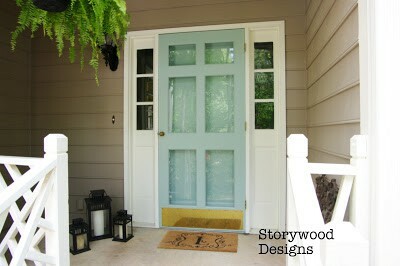 The crowning touch to the new paint job was the selection of Wythe Blue for our doors. You can read that story here. We love living in a heavily wooded neighborhood, but it’s hard to believe that we took down 27 trees when we moved in in order to create a yard for our boys to play! It still feels like we live in the woods but a big backyard for ball playing and firefly catching is wonderful! I am working on developing a green thumb and have loved our little backyard garden the past few years! My garden story can be found here. One of the big selling points when we bought our house was our “friends” entry. It’s a little nook between the house and the garage; the door that friends use to enter our home and the space where the boys drop their backbacks and jackets. I dreamed of it being a fun and casual space and had fun with the changes in there. My favorite project of all my home projects is in that room… the painted floors. You can read about how I decided to change the floors here and the story of finding the perfect piece to finishing the foyer here. Our house was built in the early 1980’s so we have a formal living and dining room space. While we’re not a formal family, I love having the rooms. I grew up with a formal living and dining room and have enjoyed making the spaces work for our family. Our living room is a quiet space… no Skylanders or Legos allowed! It’s a spot to read a book or magazine without the hum of the TV in the background. It’s a space to sit down and write a letter and my favorite place to snuggle in and catch up on my favorite blogs. Read the story of decorating my living room for the holidays here. While we’re not really a formal family, we do have a formal dining room. It’s full of furniture special to me and to my family. I have dreams of making it a little more functional for our family but am not quite ready to let you of the special memories it invokes for me yet. Read more about why I’m grateful for our dining room here and how its story inspired my custom furniture painting business. Our family room is the literal heart of our home. It is where we gather with family and friends, celebrate birthdays and holidays… where we get to be a family. I have a bit of an obsession with fireplaces and our family room has the only fireplace in our home. In the winter, we hunker down on the couch or on big pillows in front of the fireplace. I love the way the light fills the room through the summer. Our family room is an odd shape with a bay window, full length front windows and doors that lead to our screened porch. We have arranged and rearranged the room countless times, moved furniture in, out and back in again but I think we’ve finally found an arrangement that works! Read the story of the family room’s latest addition here… it marked the first time I altered and painted one of my own family pieces of furniture! If there’s a room I’m most proud of… a room that’s undergone the most drastic transformation in the six years we’ve been here, it’s our kitchen. With nothing more than a ton of paint and a lot of sweat equity, we were able to transform it from a dark room stuck in the 1980’s to a bright, open and airy space. Removing some cabinet doors let us test an open shelving concept without a huge commitment (and we learned that we love it!). We still have big plans for this room (new countertops and appliances are at the top of the list) but by working with what we had and taking advantage of the power of paint, we made our kitchen a space we’re happy to be in. Read our kitchen’s story here (including a before picture!) and you can read about the story of my search for the perfect kitchen table here. It’s fun to look back and see how much progress we’ve made in transforming this house into our home. The to-do list is still long, but for me, that’s part of the fun and part of the story! I hope you’ll stop by Storywood Designs, introduce yourself and follow along for more of my stories! Thank you so much Suzy for having me at Worthing Court today and for letting me be a part of your House Snooping series! Thank you so much, Holly for allowing us to snoop around your oh-so-lovely home! I love your slipcovers, your painted furniture pieces, your color choices, and I could name a thousand more loves. Pssst! Did you know we’ve snooped around lots of other houses? You can view them all by clicking HERE. What a lovely home. Everything looks great and I love the kitchen. yay! love holly and her gorgeous home! What a great home love the kitchen table and curb appeal!! Hi Hollie, my daughter’s name is Hollie. You tugged at my heart right away. I love you home, it speaks of family and really people living a real life. Neat what you have done in the kitchen. I will go over and check out that post. So pretty…and I just love Holly! Thanks so much Suzy for featuring my home on House Snooping! And thanks to all for the kind comments! This one is so homey and the colors are really nice.